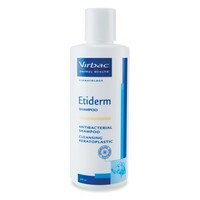 Etiderm Dog Shampoo is a microbial balancing shampoo designed for dogs; a gentle hypo-allergenic antiseptic shampoo. Etiderm represents a breakthrough in skin care technology, using Spherulites and Chitosanide. Spherulites are an exclusive encapsulation system which provide for the slow release of ingredients long after the shampoo is rinsed off. Chitosanide is a natural biopolmer which creates a protective film on the skin and hair. Etiderm is a shampoo for dogs; wet the coat with warm water and apply sufficient shampoo to create a rich lather. Massage into the coat with circular movements and leave for 5-10 minutes. Rinse thoroughly with clean water. Use initially twice weekly reducing to once weekly or as directed by your veterinary surgeon. Suitable for use as a regular shampoo in breeds that are susceptible to troublesome skin conditions. Active ingredients include ethyl lactate, benzalkonium chloride and chitosanide in encapsulate and free forms. My Bearded Collie had developed dry flaky skin, and this shampoo cleared it up brilliantly after the first use! I woudl recommend it to anyone whose dog has a similar skin problem. As previous reviewer, I too have a westie and it cleared up his skin brilliantly with regular bathing. I'm so happy with the results and so is he! No more scratching and no more scabs.Excellent shampoo! Brilliant shampoo, it cleared up my Westies skin condition in no time.